In 12-inch skillet, cook beef over medium-high heat 5 to 7 minutes, stirring occasionally, until beef is thoroughly cooked; drain. Stir in broccoli, mushrooms, water, ginger and contents of seasoning packet from soup mix. Heat to boiling. Cover; simmer 5 minutes, stirring occasionally. Break up noodles. Add to beef mixture; cook uncovered about 5 minutes or until noodles are tender. Serve with soy sauce. 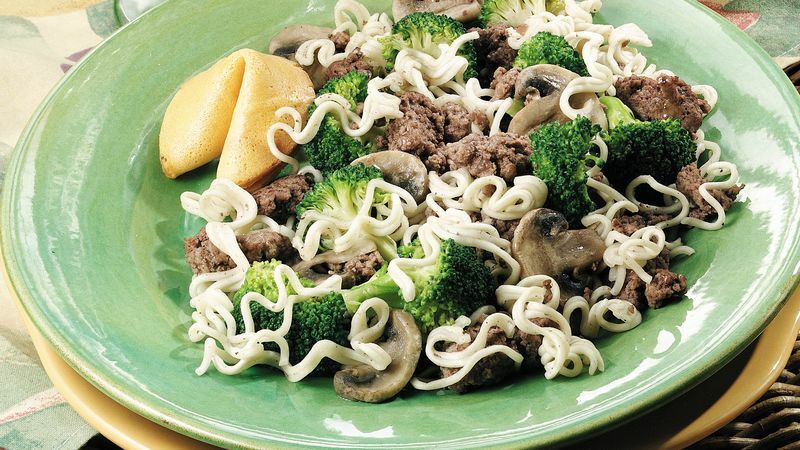 The kids will love the curly noodles, and it is a great way to get the kids to eat their green veggies. Have broccoli florets in the freezer? Use 3 cups frozen, no need to thaw, for the fresh. You can use 2 teaspoons grated gingerroot for the ground, if you have fresh on hand.